Can you believe Halloween is just around the corner? It certainly doesn’t feel like it’s been a full one year since the last one. I could swear that time is speeding up. Just for the time it takes you to read this post, I’d like to take you back in time to last year’s Halloween. In October 2009 there were two cupcake challenges that I participated in. One was Iron Cupcake: Earth, where the theme was “music”; the other was Cupcake Hero, where the theme was “Halloween/pumpkin”. I wanted to compete in both. I also had a package of zombie hands and spiders cupcake toppers that I had ordered from Bake It Pretty. Hm, how to put them to good use while coming up with an idea for both competitions…. This scary zombie cupcake was thus born. I entered it into Iron Cupcake: Earth, and the song I chose to go with it was one of the best all-time songs ever, Michael Jackson’s “Thriller”. It was perfect! I entered it into Cupcake Hero as well. It wasn’t very popular in the voting polls, but that’s okay because since posting it on my blog, this cupcake has received thousands of more views than any other recipe I’ve posted. I’m surprised to see that this year, my zombie hand cupcake is once again the most popular recipe on my blog so far in October. It was even listed in the St Louis River Front Times in the Best Twelve Halloween-Themed Cupcakes (at #9) on October 12, 2010. Click here to view the original post with more pictures and details. 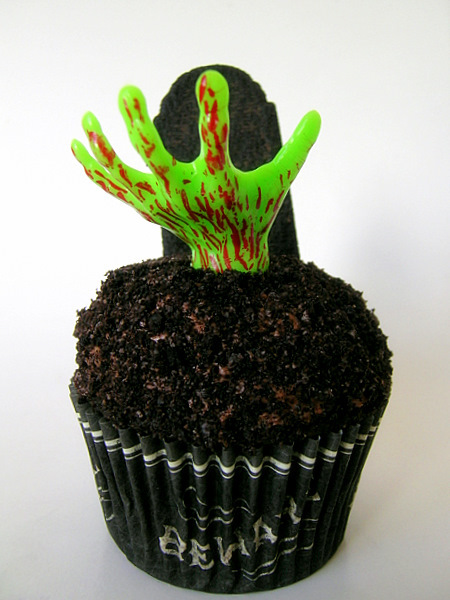 To sum it up, the zombie hand cupcake is made up of a chocolate pumpkin cupcake filled with pumpkin buttercream. It is frosted in a mound of chocolate frosting which is completely coated with finely crushed Oreos. The “tombstone” is one half of an Oreo Fudgee cookie. These are one of THE best cupcakes I have EVER had the pleasure of eating and making. These little cuppies blew my mind. The inspiration for the combination of flavors came from looking at one simple recipe for a caramel pumpkin pie. 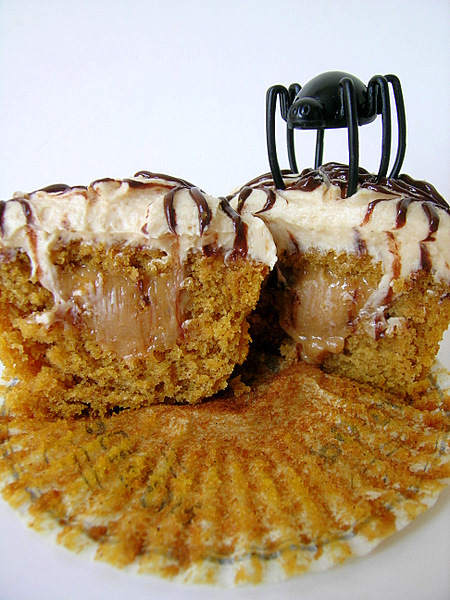 A little later, I turned that idea into these pumpkin dulce de leche cupcakes. They start with a pumpkin cupcake that is filled with dulce de leche. They are frosted with dulce de leche buttercream and the spiderweb design is simply melted chocolate with a smidgen of shortening mixed in. The spiders looked great on them. And I entered these into Cupcake Hero as well, which won me a place in the throwdown with Samantha of Sweet Remedy – we ended up tying for first place! I just can’t express in words how delicious these were, you just have to make them for yourself! So I bring you a little pumpkin cupcake with white chocolate frosting, drizzled in caramel sauce and topped off with a shard of walnut praline. It’s the first cupcake picture I’ve ever taken outside. 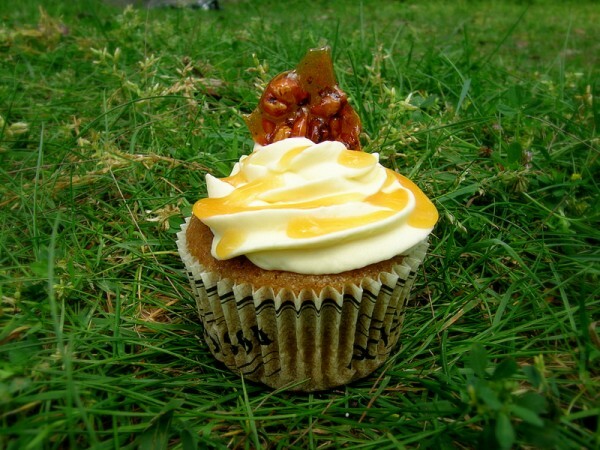 It’s sort of a contrast in a way, to me, with this Autumn-themed cupcake, sitting on bright green grass. Autumn should be chilly, the deciduous vegetation should be turning brown, but here in Sydney, it is Spring, and whatever was dormant over the Winter is now coming back to life in brilliant shades of green. Beautiful, yes, but it’s completely backwards to me. It’s something I will never get used to. Pumpkin cupcakes with white chocolate frosting, caramel drizzle and shards of walnut praline. The perfect autumn cupcakes! For the cupcakes: Preheat oven to 350 degrees. Line cupcake pans with paper liners; set aside. In a medium bowl, whisk together flour, baking soda, baking powder, salt, cinnamon, ginger, nutmeg, and allspice; set aside. For the frosting: Stir white choc and whipping cream in pan on low heat until melted and smooth. Cool. Add butter, sugar, and vanilla and beat on high until light and fluffy. Frost cupcakes. Drizzle with caramel sauce. For the praline: Spray a rimmed baking sheet with cooking spray; set aside. Bring sugar and ¼ cup water to a boil in a small saucepan over medium-high heat. Swirl pan to dissolve sugar. Wash down sides of pan with a wet pastry brush to prevent crystals from forming. Boil until sugar turns light amber, about 7 minutes. Add walnuts and salt; cook, stirring constantly, until walnuts are toasted and caramel turns dark amber. Pour onto prepared sheet. Let cool completely. Break into shards and poke down into the tops of the cupcakes. That is kinda scary that green HAND… ooo but crushed oreos, YUM! I’ll just have to eat it with my eyes closed. Yeh halloween, sometimes I don’t even realise until it’s passed. 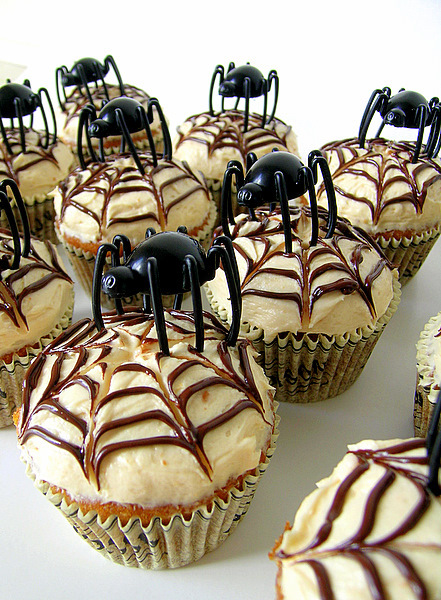 that spider one filled with dulce looks fabulous but that walnut praline on the pumpkin cupcakes is totes calling my name! I love your pumpkin cupcake, it sounds so fall! I have got to try that white chocolate frosting sometime. I have been looking for a good one. Happy Chocolate Cupcake Day! It looks great. my daughter got excited when she saw the images. I guess I have to try the recipe :D.